Dave Buchen and Clare Dolan will present an illustrated history of this fascinating performance form. In addition to the illustrated lecture, they will share footage of picture-story recitation from around the world, including Indian, Australian, and Iranian performances, as well as contemporary cantastoria performed by artists, activists, writers and puppeteers in the U.S. This cabaret-style evening presents Cantastoria and cranky shows in the grand tradition, celebrating stories of mayhem, intrigue, and the small triumphs of the downtrodden, with live music by the Banners & Cranks House Band! 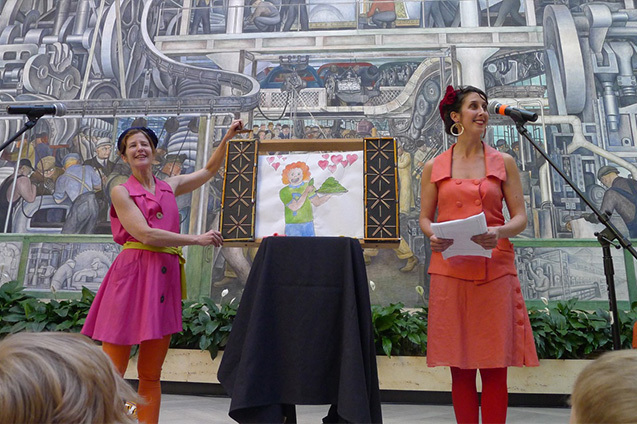 This event presents cantastoria and cranky shows in the grand tradition, geared towards family audiences, with live music, moving pictures, and lots of stories. ArtYard is pleased to present a unique and wonderful event, the Banners and Cranks Festival, November 17-19 th. 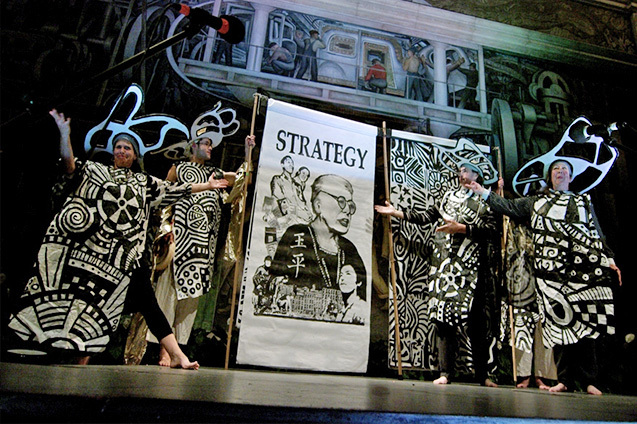 Banners and Cranks represents the reinvention, pioneered in large part by Vermont’s Bread and Puppet Theatre, of the pre-cinema narrative technique of Cantastoria, in which spoken or sung stories accompany moving images painted on banners or scrolls. 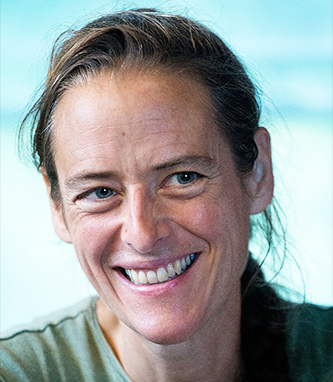 It is uniquely suited to ArtYard’s mission of fostering artistic collaboration between visual artists, musicians, poets and random humans of varying stripe. 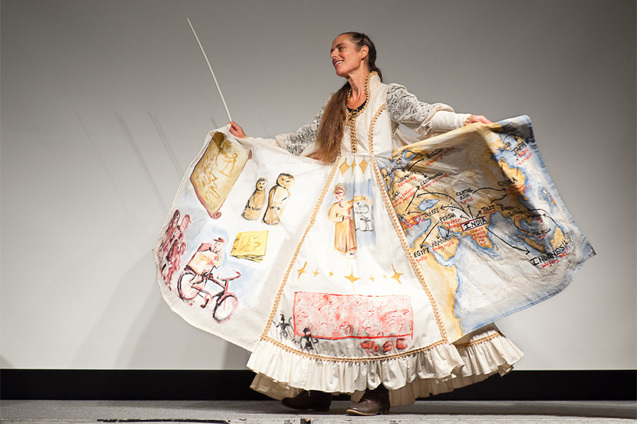 The festival will feature the work of ten artists from local and far-flung regions of the U.S. Cantastoria is the Italian word for an ancient performance form involving the theatrical display of paintings accompanied by sung narration. A precursor to modern puppet theater, this practice originated in 6th Century India and spread East and West, with many different variations in style and subject matter. Recently there has been a revival of interest in Cantastoria among puppeteers, artists, and activists in the West, who find that this ancient form has startlingly modern qualities and can easily be infused with fresh content. The use of the cranky (a sister to the cantastoria in which the images appear on a scroll which is turned by means of a crank) has also lately grown popular among folk musicians and artists looking for new ways to perform their songs and display their artwork in a performance context. 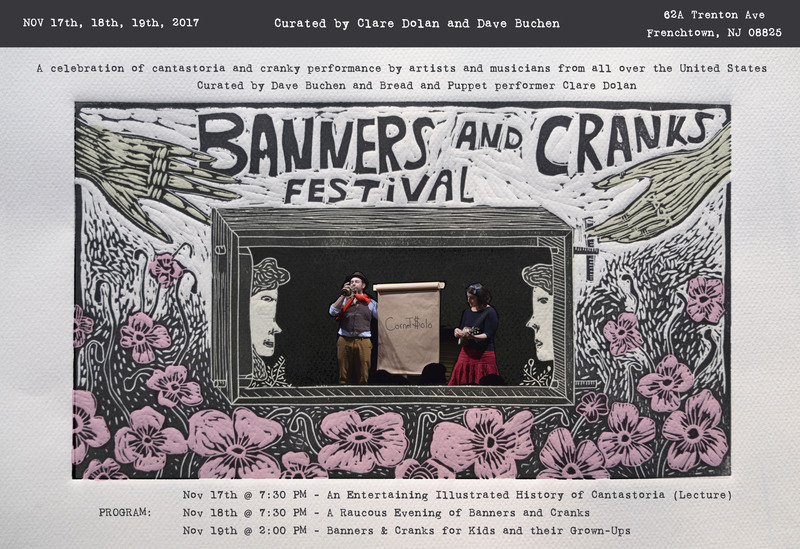 Banners and Cranks is committed to the concept of a nomadic festival, both because it is in keeping with the historic itinerant roots of the performance form, and also because they hope that the fest will reach new audiences of makers and thinkers who have never seen cantastoria before, inspiring the uninitiated to take up the form and invent fresh approaches to the magic of the cranky and the picture story. This is a living and breathing folk performance practice that has its own particular place alongside the technology and media of the 21 st century. 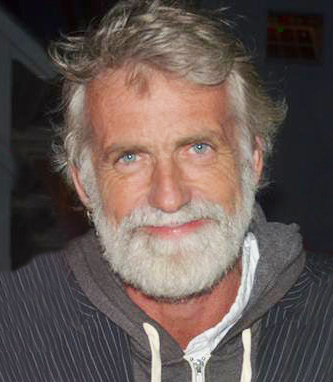 Dave Buchen has been co-coordinating the Banners & Cranks since its inception. His cantastoria projects include Natural History by Plinius the Elder and the 7-year long Baudelaire in the Box project. He is a member of Chicago’s Theater Oobleck, for which he has written numerous plays and San Juan’s El Teatro Bárbaro, for which his children would like to remind him that they are the bosses. As a printmaker, he has made numerous books and a yearly calendar since the previous century. He plays with La Banda Municipal de Makula-Barun.